AE Business Solutions is a leading IT and Workforce Management company serving enterprise organizations throughout the Midwest. Helping you ask and answer new questions. Enterprise technology growth is outpaced only by the number of attacks against it, transforming security into the most critical consideration of a modern enterprise technology stack. The barrier to entry for intellectual property theft, customer personally identifiable information theft, and ransomware attacks has dropped with the availability of inexpensive phishing, malware, and exploit kits. Corporations today are faced with internal security threats, external user-based security threats and malicious activity from 3rd-party cyber organizations targeting large corporations and assets. Organizations can no longer afford to treat security as a “second class” IT citizen. Reputational risk, federal/state regulatory compliance and the total cost of post-breach remediation have brought IT security to the front of the business line. AE Business Solutions’ security practice designs and implements vetted architectures, innovative solutions, and services to build multi-layered strategies that safeguard assets and information. AE’s Security Practice brings together best-of-breed solutions and services to prevent and resolve critical business security issues. Networking is the backbone of the modern IT-centric enterprise. As IT services have moved from “nice to have” to “unable to operate without”, the importance of a properly functioning and performing network has become business critical. Creating a diverse network is a vital need in today’s environment. People need to access the Internet, communicate and share information in a secure and safe manner. Whether your network is wired or wireless, campus or branch office, BYOD or corporate asset, cloud or on-premise, AE delivers comprehensive solutions that address existing enterprise needs with an eye for the future. AE has extensive, real-world experience assisting modern enterprises, focusing on mobility, application performance, network resiliency and cloud strategies. network & Security Partners please click here. We live in a data-driven marketplace. The art and science of decision making has evolved. In the past, organizations were driven by complex high risk Business Intelligence platforms that historically come with high costs and extensive maintenance & upkeep. AE Business Solutions is helping clients change the way data is delivered to decision makers and guides them toward a rapid agile methodology. AE helps organizations of all sizes deliver analytical solutions to support the enterprise. One of AE Business Solutions' core values is putting our clients first. We believe in developing trust and a partnership in order to understand business needs before making any recommendations for a technology or strategy. We offer innovative solutions from leading vendors in the marketplace. Our team is led by experienced Architects and Engineers that are highly skilled and trained to help uncover the real value in a client’s data ecosystem. AE Business Solutions helps our clients realize greater value from their data in a more precise and effective manner. The Volume, Variety, Velocity and Veracity of data in today’s marketplace is an overwhelming challenge. The market dictates that trend will not slow down but only become more increasingly challenging for our clients. AE Business Solutions can help improve operational efficiency within an organization and, as a result, increase productivity at a lower cost. With a variety of Business Intelligence platforms and Data Lake repositories such as Hadoop, MPP and Cloud, we can help drive better, faster and cheaper solutions that will drive value and ROI for your business. AE Business Solutions is focused on assisting clients in achieving a significant return on the investments made in their Business Intelligence platforms. AE supports our clients on all technical and functional aspects including a variety of data integration and advanced analytic solutions. business intelligence & analytics PARTNERS PLEASE CLICK HERE. AE Business Solutions’ Workforce Management Center of Excellence approach aims to bridge the gap between our clients’ Human Resources Department and Information Technology Divisions, by consistently providing highly qualified technology professionals on a contract, contract-to-hire or direct hire basis. AE's goal is to help strengthen our client's organizations by identifying, empowering and inspiring people. Candidate Variety: The best candidates are not always the ones who are currently seeking new opportunities. AE’s Workforce Management Recruiters seek out the best possible candidates for each unique requirement and client, regardless of their current employment status, allowing AE customers access to a diverse pool of potential candidates. Exclusive Resources: AE’s Workforce Management team has direct, in-house access to some of the industry’s top technology experts who are available at any time to provide guidance, support and even candidate recommendations and referrals for technical requirements. Emphasis on Culture/Personality Fit: In today’s rapidly evolving technical and business climate, accurate personality and cultural fit are critical in ensuring new-hires can adapt quickly and efficiently to new environments. AE’s Workforce Management Recruiters are experts in social and psychological candidate qualifying and strive to ensure each candidate presented to a customer not only has the precise technical skills necessary, but also aligns with the clients organizational/team and growth objectives. AE Business Solutions’ Managed Services is a long-term solution to provide day-to-day administration and support for enterprise clients’ IT environments with convenient monthly payments. AE’s Managed Services provides peace of mind by enabling our clients to utilize their IT resources to their fullest potential. Managed Services helps put the focus back on the client’s core competencies. AE Business Solutions utilizes local resources working at either the client’s facility or at AE’s Wisconsin offices, allowing for a customized blend of local and remote support. With AE, the client partners with a team that prides itself on customer service above all else. AE Business Solutions’ goal is to integrate seamlessly with a client’s processes and procedures, all the while saving the client time and money. Through AE’s Managed Services, clients gain direct access to AE’s team of seasoned architects, administrators, and engineers. All of AE Business Solutions’ team members stay up-to-date through continuous training and certification. Together, the AE team has extensive experience with the delivery and administration of solutions, giving them the expertise and background to best support clients’ complex IT environments. 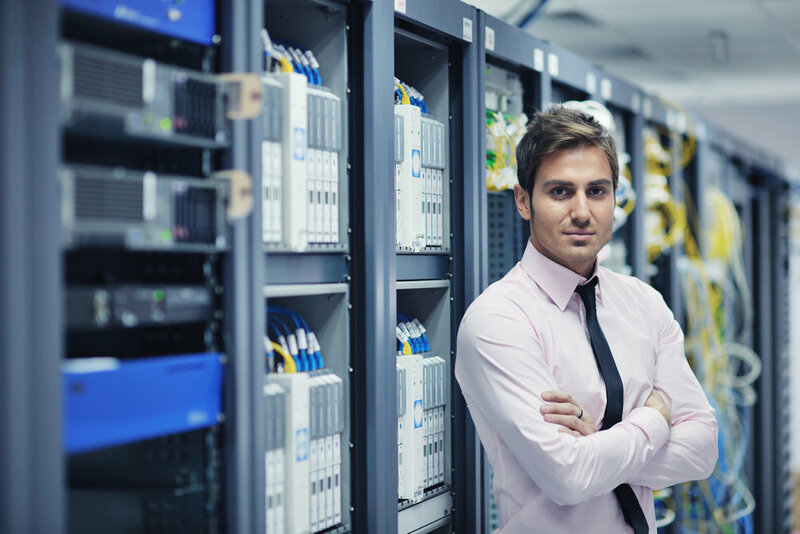 From network upgrades and expansions, to complete system deployments, AE Business Solutions can help you with any IT projects from start to finish. AE has expertise in all phases of IT service delivery and can implement a process that includes discovery, design, planning, and implementation of hybrid IT solutions designed expressly for your needs. With thousands of business IT projects under our belt across industries, including: healthcare, finance, education, hospitality, manufacturing, and retail, AE’s Solution Architects and Engineers make sure the technology delivers the business outcomes that make our clients successful.